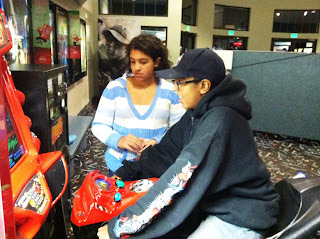 Before we saw Arthur Christmas the other night, we had a few minutes, and the kids wanted to play the racing game there. First Kendall jumped on and raced, and she loved it. So she called Delaney over and asked him to take a turn. He won his race, getting first place, and won a free game. 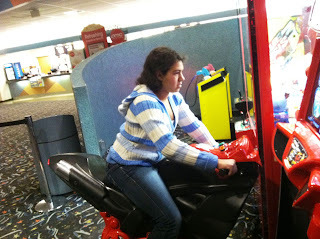 While Kendall went to get seats, and Tia and I got drinks, he got to race a second time. Not sure how he did, but he walked up with a big smile on his face.